Schuller and first I met in 1969 at Duke Ellington’s 70th birthday party at the White House. The last time I called him, a year or so ago, I asked about progress on volume three. I told him that I was recording the conversation for possible future use. How I wish that the use were under happier circumstances. Gunther’s answer touches on the dilemmas that often confront artists who face the realities of existence. Look, here’s the story. I have received in the last two-and-a-half years twenty commissionsthat’s the term for writing pieces of music for somebody, for a symphony, for a chamber group and so on. That is unheard of in the whole history of music, for a composer in a two-year period to get twenty commissions. I remember when Aaron Copeland and I, one year about half a century ago, each got four commissions in a year. We thought that was unbelievable, and Aaron said to me, “What the hell did I do to deserve this?” So, the conundrum about the jazz book or the autobiographyI also promised a second volume of my autobiographythe conundrum is this: when I compose music I make money. I have not retired. I have to work. I have to write all these pieces, and I need to make money. While, on the other hand, if I start writing a book, I lose money. To be specific, for example, to write a book might take me six years, especially a complicated one which would like to deal with most of the music that has happened in the period since my second volume ended. Then there would be, maybe, two to three years to find a publisher, then the production of the book. Then, finally, the next year I might get a royalty check for a hundred and twenty dollars and thirty-two cents. So, when I write books I lose money. When I compose music I make money, which, as I say, I still have to. I’m 88 years old now. I’m very productive. 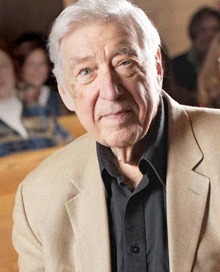 Gunther Schuller is somewhat famous for figuring out how to do things, and he’s done a lot of multi-tasking in his life. And one way or another, unless I get very sick or something, I’m certainly determined to do that extra volume. How I would manage it right now I don’t know, but I will do it, particularly if I live quite a few more years. And mind you, the other problem is that the second volumeThe Swing Era bookwas totally comprehensive. Anyone I talked to, I wrote extensively about them. I listened to every damn record that Tommy Dorsey recorded (he laughs), and the first four years of Dorsey’s band were not the most exciting listening, until Sy Oliver came inwow. Anyway, it was totally comprehensive. I cannot do that. I listened to 30,000 records to write that volume, to be that comprehensive. I would have to be more selective, and that’s fine, too. So, somehow or other, I will figure this out before I die. I know of no evidence that he started volume three. Thank you for sharing this Doug. Early Jazz and The Swing Years are two of my favorite books and I had been looking forward to Gunther Schuller’s next volume in this series for more than 25 years. However, I remain thankful for what he did write and his many contributions to music. Glad you recorded this conversation and posted it here. In March 2014, I was surprised to receive a phone call from Gunther Schuller in response to a piece I wrote about his friend and colleague Leonard Altman. Gunther said he had not thought about Altman in years, and thanked me for rekindling his memories. He also enquired where the piece would be published, not realizing that it had already appeared at the Azure Miles Records site. When I enquired about what he was working on, Schuller described spending something like sixteen hours a day composing, which I assume included the making of parts. With the subject of composers and scores in the air, I mentioned how it is estimated that only half of Johann Sebastian Bach’s music is believed to have survived, with the rest of the scores lost, and Gunther responded by marveling at how much time it most have taken for Richard Wagner simply to notate his music dramas. The tempo of Schuller’s speech was lively, and he spoke with much excitement. I recall that when I studied with Mel Powell at CalArts, he spoke with great admiration for Schuller. Before then, when I was a student at Tanglewood, I recall one class with Gunther where the room had become unbearably hot. This prompted him to walk over to the window, and with considerable strength, he pried it open before the rest of us could react, exclaiming: “I do everything around here!” The main point I recall that Gunther made about music, pertaining equally to composition and improvisation, is that technique itself is unremarkable and common, implying that it is only noteworthy when and if it serves to articulate meaningful content. Sad to hear of his passing. I use his books regularly and find them invaluable, especially The Swing Era, where he wrote wisely on some of the more obscure bands. Unfortunately the musical annotations mean little to me, but they are wonderful and I hold his work in high regard. His writing will be valued, I am sure, far into the future. As a society, we really do need to figure out a better way to support our artists. Far too many must pay their bills from day jobs, or from the day jobs of spouses. Who is to say that another book would have been of greater artistic value than the commissioned works? Ultimately, I’d like the artist to be able to make that decision on its artistic merit and his interest rather than the economics of survival or even comfort. By contrast, what do the CEOs and wheeler-dealers of corporate America contribute in exchange for their astronomical paychecks? Or those “stars” of pop music?